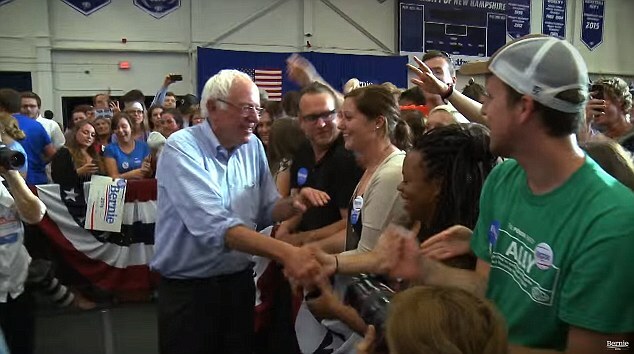 I watched Bernie Sander's acceptance speech in New Hampshire last night with awe and wonder. If I was twenty again, I'd probably be excited too. But I'm not twenty. The way that many twenty-somethings will probably interpret my political shift will be to suggest that I used to be open-minded, but got old, and old equals close-minded. At least, it does if you don't agree with them. What else could it possibly mean if someone has a different opinion about something so important? "I mean, they must disagree because of some defect in their personality, I bet. Yeah, that's it. That explains it." With this approach, no one ever has to question their beliefs, plus you don't need evidence, which is pretty good if you want to get a good nights sleep. Here's how I explain it; on a rare occasion, I find a youngish person who actually knows something about their culture, it's history, about how an economy works or why our political system was designed as it was, which is almost as rare as a moose with an advanced degree in physics, but, admittedly, it does happen. More often that not, though, their thinking represents a jumble of ideas, a few slogans and a meme or two, articulated with a righteous anger, born of a desire to appear knowledgeable, but in an edgy sort of way. "Yes, we're cool, because we care." Nowadays, though, it's just as likely to be born of an anger about high personal debts; student loans, auto loans, and credit cards, etc... Add to that an inability to find a job in their chosen field of study; "Feminism and Queer Theorists in post-war Archaeology," and, they damn well want somebody to fix it. I don't blame them. I do too. So, being committed to change, they jump on the first bandwagon with a socialist agenda. Why not? Socialism in, theory, is simple, which is the appeal. "Let's be like Sweden," they say, where weed is free and they won't have to work. "I'll get a little apt., I'll hang with my friends and life will be good." Yes, they'll sit around the coffee shop and pontificate about all kinds of stuff that was gleaned while living over the garage at their parent's house. ​I realize that I'm painting with a pretty broad brush, here, but I was young, longer than they were or are, in fact. And, at a very similar time in history. Plus, let's not forget that these little bastards are our children, so their behavior and ideas are hardly a mystery. In other words, age and experience have given me insight, at least, hopefully, they have. In the end, though, I either have evidence for my beliefs or I'm no different. And that's where all of these ideas need to be debated, on the evidence. Five thousand years of recorded history should do it, I think. A good meme is awfully tempting, though. And that, is Bernie Sander's greatest appeal. I'm just saying.